Below is the cover on the edition I read. Wonder why they made those small changes, but in any case, I prefer the first one. It's hard to see any of the details on the book I got from the library. It's a nice illustration of how small changes can improve a cover. This one gets a mixed review. It wasn't bad, but especially in the early stages, I found myself wandering away from it to read some non-fiction I was plowing through. That's not usually a good sign for an exciting work of fiction. So I did some thinking about what the problem was. I've mentioned before that I'm not super keen on books where ordinary kids find out they are some super-hero in another world, or in an unseen part of this world. Thanks to someone from the Great Middle Grade Reads group for pointing out that this is the Percy Jackson formula, and that this book suffers a bit from feeling like a PJ-wannabe, because that is the problem. Not only is it overused, but the result is a fairly predictable story line (even the use of 3 kids to make up our hero team seems to be pretty standard), and Xander is even the conventional unheroic hero who doesn't know what powers he could have because he's just so average. On the other hand... once I hit the tipping point, I had no trouble sticking with the book and finishing it, and I found some aspects of it commendable, and some were better than PJ. Really big in that area was the pacing. I recently read the 2nd Percy Jackson (The Sea of Monsters) and found that it felt like nothing but a race from one crisis to the next, with little character development or plot subtlety. In this book, there was a little slower pace and the characters have some depth, including relationships that change and develop. I appreciated that the author chose to use a non-Western mythology (I haven't checked to see if she made it up or borrowed it). I also thought she handled the parent question really well. I've had discussions before about the need to get parents out of the way in order to let the kids have their adventure. In this case, the adventure is to rescue the parent, and I thought she handled it well when Xander's father is finally found, and of course wants to take over and keep Xander safe--but he can't, and they both have to deal with that. (Come to think of it, that part is not unlike what happens in A Wrinkle in Time). It rang true, in any case. This was something I probably wouldn't have read if it weren't our GMGR book of the month (and fills the X spot on my reading challenges). 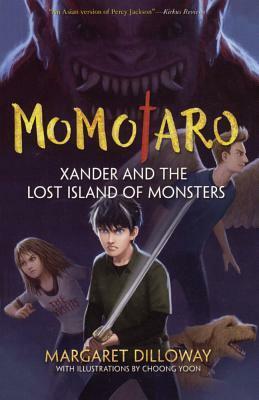 But it's a pretty good read, and I'd recommend it for kids who like adventure. Anyone who liked Percy Jackson will probably like this, though I think this is aimed at a slightly younger audience than he is--the peril feels a little less scary and there is definitely less gore. 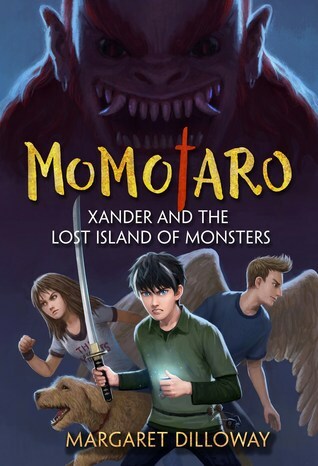 FTC Disclosure: I checked Xander and the Lost Island of Monsters out of my library, and received nothing from the writer or publisher for my honest review. The opinions expressed are my own and those of no one else. I am disclosing this in accordance with the Federal Trade Commission's 16 CFR, Part 255: "Guides Concerning the Use of Endorsements and Testimonials in Advertising."